Let's get the kids of grade 1, grade 2 and grade 3 acquainted with our 'Green Friends'. 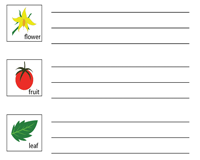 Nurture a love for Nature in the young minds with these parts of a plant worksheets. Included here is a collection of visually appealing charts, meticulously designed activities to identify and label the parts of the plant, comprehend the functions of each part of the plant and recognize the edible parts as well. The parts-of-a-plant chart is an inspirational tool that assists in identifying the parts of a plant with ease. Enhance the vocabulary of grade one children in the process. Take a walk in the park, look around and observe. 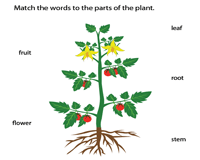 Follow up with this pencil-paper activity worksheet to identify the parts of a plant. Pick the apt word from the word bank to name the parts. 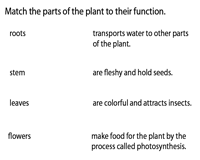 Reiterate the concept for 2nd and 3rd grade kids with this label the parts of a plant worksheet PDF. Recognize the part marked, recollect its name and fill the word box beside it to complete the exercise. Rattle your brains with this twist in the exercise. 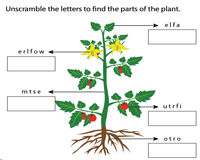 Identify the parts, unscramble the letters to figure out the part of the plant indicated and you are done with your spelling test revision! 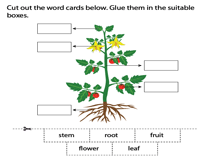 Label the parts of a plant with this cut and paste activity worksheet. Snip the word cards and glue them in the appropriate places to recapitulate the concept. Suitable for 1st grade or 2nd grade. Reiterate the concept as you make a one-to-one correspondence between the words and parts. Identify the indicated part and match with the corresponding word using this PDF for grade 1. 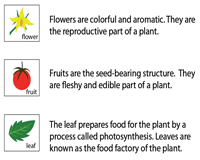 The parts-of-the-plant-and-their-functions chart for grade 2 and grade 3 gives a detailed description of the functions of each part of the plant. Learn to correlate the parts with their functions. 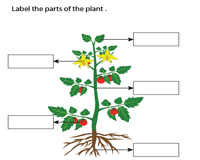 Employ the blank template to describe the functions of each part of the plant. Recapitulate the concept and test comprehension instantly with this blank template worksheet. 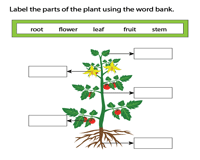 Connect the parts of a plant to the function it performs with this worksheet for grade 2 and grade 3 children. Comprehend the function of each part of the plant as you map the part to its function. Read the sentence and plug in appropriate words from the word bank to complete it. 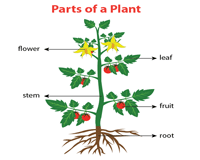 Understand the functions performed by the individual parts of a plant. Enrich your vocabulary with plant-related terminology. 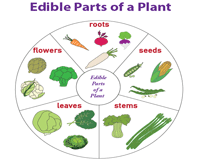 The visually appealing edible-parts-of-a-plant chart for grade 3 shows the various parts that can be eaten. 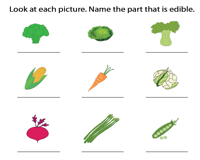 Identify the fruits and vegetables, and the part of the plant that is edible. Pose the question "Which part of the plant do you eat?" 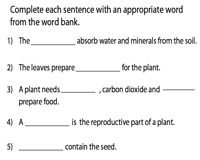 Let the children of grade 3 contemplate on which part of the plant is edible and then complete the word boxes in this worksheet. 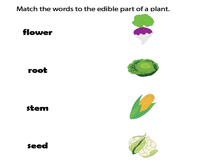 Match the parts of the plant to the picture that denotes the edible part in this edible parts of a plant PDF. Hone your skills in learning the parts of the plant and their edible parts as well.